With Mr Cameron claiming on this of all days, "Europe Day", that leaving the EU would bring us closer to war, all he is actually doing is repeating the most insidious myth of them all in relation to the European Union - that this monstrous construct has helped keep the peace. The myth finds is purest form in the EU hagiography, where the European Commission's asserts that "probably very few people in Europe know that on 9 May 1950 the first move was made towards the creation of what is now known as the European Union". Crucially, it would have us believe that this was an attempt at preventing a Third World War, but completely omits to tell us that the intellectual genesis lies not in the post-WWII period but in the 1920s, devised is response to the problems arising out of the First World War. 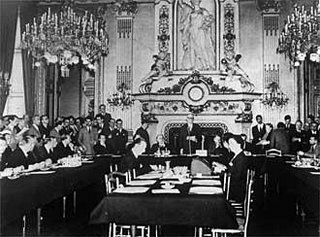 For the myth-makers, though, the origin of the EU was Paris on 9 May 1950. 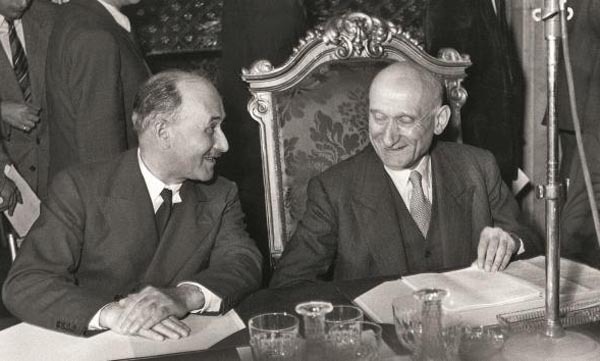 Against the background of the threat of a Third World War engulfing the whole of Europe, the then French Foreign Minister Robert Schuman (pictured above, right, with Jean Monnet) read to the international press a declaration calling France, Germany and other European countries to pool their coal and steel production as "the first concrete foundation of a European federation". This was what was on offer was the creation of a supranational European Institution, charged with the management of the coal and steel industry, the very sector which was, at that time, the basis of all military power. The countries which Schuman called upon had almost destroyed each other "in a dreadful conflict which had left after it a sense of material and moral desolation". Thus, concludes the European Commission in its own history, "Everything... began that day". At the time, the new Germany, under the guidance of Ludwig Erhard, was already showing signs of a remarkable economic recovery. This raised the question of how the new nation should be assimilated into the western European community. At the Council of Europe in August 1949 Churchill had shocked many delegates by proposing that she should be given the warmest of welcomes. Two of the western occupying powers, the USA and Britain, wanted to see her continue on the road towards full economic recovery and nationhood as soon as possible. 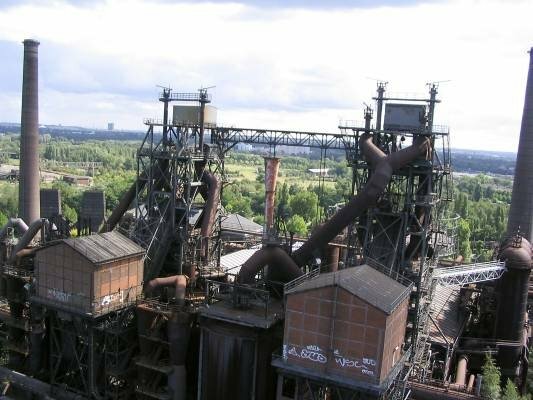 But this had provoked a deep rift with France, which wanted to continue exercising control over the German economy, for fear that she might once again become too strong a political and economic rival. Once his memorandum was complete, Monnet's next problem was how to get it adopted. He could not act as the champion of his own plan. As a natural behind-the-scenes operator, his style was always to act indirectly. He needed to win over very senior support in the French government. In this, Monnet had constant contact with senior members of the French government. His obvious choice was foreign minister, Robert Schuman. It would be he that would have to face US Secretary of State Dean Acheson in a few days time. Monnet knew that his officials had few ideas to offer. He would most likely, therefore, be receptive to some new ideas. Furthermore, as a potential advocate, Schuman had other advantages. 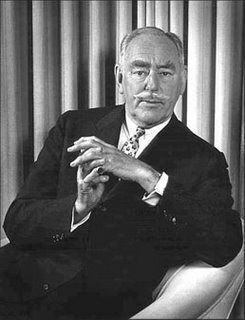 Born in 1886 in Luxembourg to a German mother, he was fluent in both German and French, having read law at the universities of Berlin, Munich and Bonn. He had then moved to Alsace Lorraine when it was under German rule, which meant that in 1914 he had been recruited into the German army. Yet in the Second World War, when Alsace Lorraine had again become part of Germany, he had, as a French citizen, been arrested by the Gestapo. He was thus a perfect witness to the need to resolve the Franco-German conflict. But, with the backing of the commission, the myth endures. Hilariously, though, when I addressed a group of 150 sixth-formers recently, on the history of the European Union, not one of them knew that 9 May was "Europe Day". For all the effort the EU has expended on cultivating its core myth, it has failed to have any decisive impact. Whether Mr Cameron likes it or not, it is truly an idea whose time has gone. The core of this narrative is drawn from the recently republished book, The Great Deception, by Christopher Booker and Richard North.